mouse,press the F5 can disable or enable touchpad function. This is wireless 2.4Ghz QWERTY portable multimedia big size 3 LED backlit Keyboard and touchpad combo with USB receiver packed. This keyboard has a new breakthrough in supporting multimedia control key from F1 to F10.and also make a breakthrough in indicators by adding Low power and CAPLOCK indicators except traditional Rii's keyboard charging and RF wireless indicators. 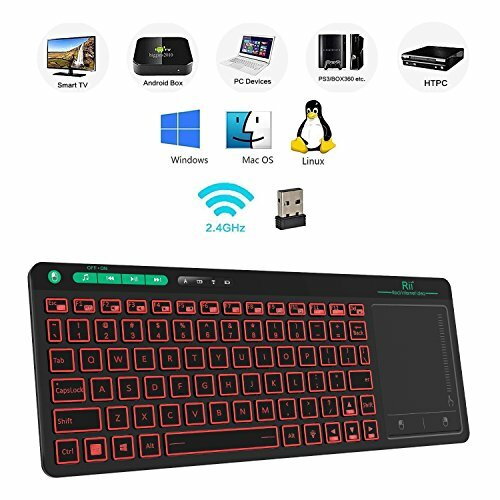 Generally, this keyboard can work well on the smart TV,but different smart TV have different system,Especially Samsung Smart TV,so we can not make sure that this keyboard can compatible with any system,before you order ,you can use the common wired keyboard and mouse on your device if they can work well ,the keyboard and mouse combo can work well,too. If you have any questions about this product by Rii, contact us by completing and submitting the form below. If you are looking for a specif part number, please include it with your message.